Ideal for small gifts for any special occasion. Note: As different computers display colors differently, the picture may not reflect the actual color of the item. 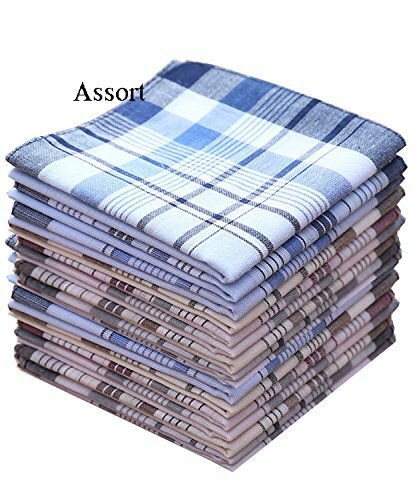 Handkerchiefs are made by cloth, and cloth are made by yarns. Count is the number of yarn. The more yarn, the fine and closely woven of the cloth. So the more count, the better quality of the handkerchiefs. Usually, 60S or above handkerchiefs are middle and top grade. It¡¯s good for self-use or gift. Handkerchiefs are graded by the count of yarn. The more count, the finer yarn, and the thinner and softer of the handkerchiefs. Double yarn or other special textile craft an exception. So the handkerchief is not thicker the better. In principle, the handkerchief is thinner more expensive. The most expensive handkerchief, it¡¯s single layer is transparent to light. There will be a slight fade when washing the dark color handkerchiefs at the first time. So please wash it separately. Meanwhile, please do not use hot water or larger alkaline cleaning products. To put some salt in the water can enhance the color fastness. Handkerchiefs are made by cotton, so gauffer is inevitable. After washing, level it, and heal it after it¡¯s dry. If conditions permit, the best method is to iron it after washing, and the handkerchiefs will be kept as new. To use fen soap to wash it, will leave a hint of fragrance. Condition: Brand New and High Quality. If you have any questions about this product by LACS Handkerchiefs, contact us by completing and submitting the form below. If you are looking for a specif part number, please include it with your message.